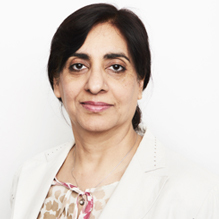 Dr Lubna Anwar is a highly experienced Consultant Psychiatrist currently working for Barnet, Enfield & Haringey Mental Health NHS Trust. She has a Medical Degree and Diplomas in Cognitive Analytical Therapy and in Transpersonal/Integrative Psychotherapy. She is also a Member of the Royal College of Psychiatrists and a Member of the General Medical Council. She has over 8 years’ experience working in the NHS and private sector. Dr Anwar has extensive experience in providing diagnostic assessments for a wide range of mental health issues in adults, including Psychosis, Autism (ASD), Anxiety, Depression, Low Self-Esteem and Trauma. She believes in a holistic, person centred approach to human interaction as a key to change and recovery from emotional and mental suffering. Therapies include Cognitive Analytic Therapy (CAT) and Integrative Psychotherapy. Dr Anwar is described by her peers as a hardworking, thorough and conscientious clinician, who is very reflective on her practice and maintains an excellent service to her patients. Clinical Partners are delighted to present Dr Anwar to our London patients. You don't need a GP referral to see Dr Lubna Anwar.